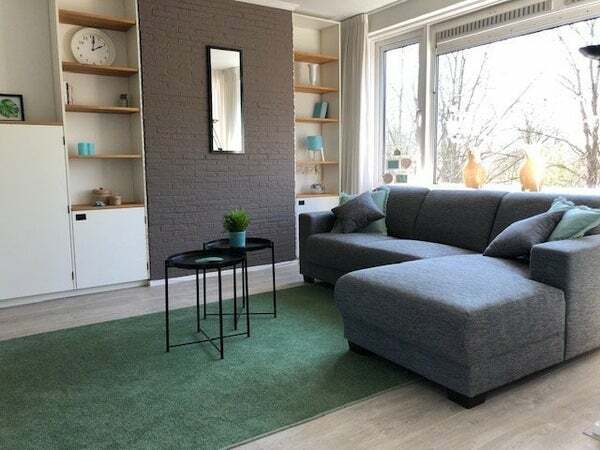 Near the center of cozy Aalsmeer we offer this spacious apartment. The apartment is tastefully decorated and has two spacious sunny balconies. There is ample opportunity to park at the front of the apartment building. Via the central hall you reach through the staircases the third floor. Through the hall with separate toilet you enter the spacious and bright living room with seating area and dining area with large dining table. There is a comfortable lounge sofa in the seating area. The living room gives access to the first sunny balcony with a comfortable couch. The separate kitchen is fully equipped with an oven, fridge, washer / dryer, 4 burner gas hob and extractor. The kitchen gives access to the second balcony. The master bedroom has a wonderful box-spring double bed and plenty of cupboard space. This bedroom gives access to the bathroom with shower and sink. The apartment is two minutes walk from various shops and public transportation. The old center of Aalsmeer is 8 minutes by bike. The Westeinderplassen where you can swim and water sports are 5 minutes cycle distance. Amstelveen, Hoofddorp and Uithoorn are easily accessible by public transport and by car.